Looking to rent the best portable heaters? Portable Heater Heaters are essential to keep your crews warm and working through-out the winter. We carry the highest quality, warmest heaters that are highly rated for safe operation. With outstanding service, prompt delivery, convenient pick-up and competitive prices, the Duke Company is proud to be one of the HeadQuarters for Heater Rental equipment in Rochester NY, Ithaca NY, Buffalo NY, Syracuse NY and Western NY. Questions about Which Portable Heater to Rent? 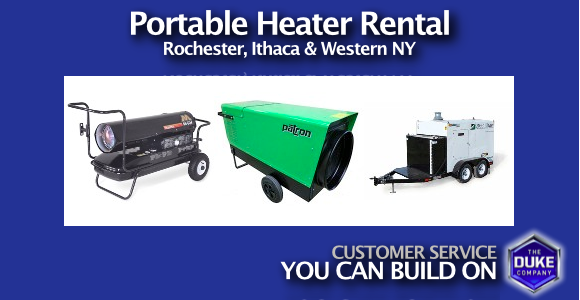 The Duke Company is Western NY’s leading portable heater rental HeadQuarters! From Forced Air Heaters, Ground Heaters, Ground Thawing Heaters, Indirect Heaters, Infrared Heaters to Portable Electric Heaters, we would be glad to deliver the right Rental Equipment and Tool Rental equipment for your exact needs. The Duke Company’s winter heat specialists are standing by to assist you with outstanding customer service. For immediate service, call 585-292-9870 (Rochester NY) and 607-347-4455 (Ithaca NY). Ideal rental heater for heating spaces with proper ventilation like construction sites, open garages and open work areas. Ask us about the incredible quality of MiTM, DayStar and Val6 heaters. They are available in a range of powerful heat ranges from 51,000 to 600,000 BTU. Relied upon by a range of construction professionals, Ground Heaters are rented for heavy-duty heating appellations like curing concrete, thawing the ground and preventing wells from freezing. The Duke Company Rents outstanding heaters renown for exceptional quality, safety measures and durability by Wacker Neuson, Ground Heater, DryAir and GreenDry. Ask us about which ground heater rental is best suited for your needs. Ranging from 290,000 to 436,000 BTU, our HeatKing rental heaters are powerful enough to heat 10,000+ square feet and have run times of greater than 60 hours. The Duke Company carries exceptional indirect heater rental equipment from the world’s best manufacturers including FrostFighter and Flagro. If you are looking to rent a heater that can be safely operated, indirect heaters operate outside, and air duct is used to transport the heat into a building, garage, warehouse or other structure. Advanced technology by Val6, has created powerful infrared heater rental equipment that is capably of producing 58,000 to 114,000 BTUs of radiant heat. Looking to rent a heater that has incredible safety characteristics? Val6’s infrared portable heater rental equipment produces heat via infrared light, that is transferred to objects that are cooler – enabling amazing even heat coverage. These capable portable heaters are not interrupted by breezes or air flow. To keep your crew warm indoors, rent our Patron rental heaters to keep your crew comfortable while they work in cold, indoor environments this winter. From 5,100 BTUs to 205,000 BTU’s, Patron’s heater are renown for exceptional quality, energy efficiency and heating capabilities. As with all heaters, safety warnings and operating instructions are essential for you to understand and follow. Please note, make sure you follow all manufacturer safety warnings and recommendations when operating any heater or rental heater.